The Australian Building Codes Board (ACCB) later altered the Building Code of Australia (BCA) in 2013. The new requirements relate to childcare centres, bedrooms within buildings two stories or more, and bedrooms within single story buildings on steep sloping blocks where the fall from floor to ground is greater than 2m. 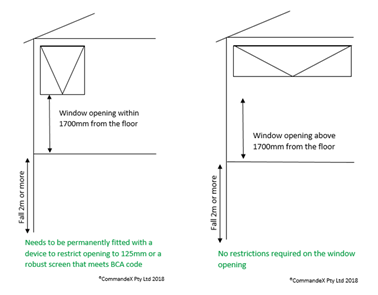 Existing buildings within Strata Schemes and Early Childhood Centres must fit an appropriate device to windows by March 2018 to prevent them opening more than 12.5cm (representing the size of a young child’s head) or a robust screen to resist an outward force of 250 N (~25 kg). Note: as a duty of care most second story windows in newly constructed buildings are fitted with devises to restrict the window opening more than 12.5cm. In some cases, the device or screen may be removable if there are no climbable elements below 760mm from the floor, but if so must have a child resistant release mechanism. For more information on the code and the class of buildings it relates to, visit Australian Building Codes Board. Our Kids Fallsafe Screens are a great choice for bedrooms and high traffic areas where you would like to fully open your window while kids play. When installed by a licensed installer, the SecureView EclipX and Xceed Security Screens comply with the BCA code, and both screens have been independently tested to comply with the Australian Security Standards, to provide both safety and home security. Our Kids Fallsafe Screen is custom made in Australia and suitable for any window setting that allows for a fixed security screen. With the option of two security screen window systems, you can be confident in finding a fixed security screen to suit your home (modern or traditional), security needs and budget. Click here to view our range of security screen products.